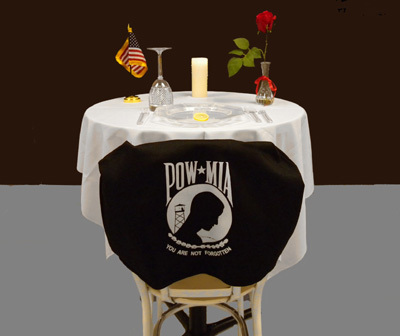 AS YOU ENTERED THE DINING AREA, YOU MAY HAVE NOTICED A TABLE AT THE FRONT, RAISED TO CALL YOUR ATTENTION TO ITS PURPOSE – IT IS RESERVED TO HONOR OUR MISSING COMRADES IN ARMS. ALL AMERICANS SHOULD NEVER FORGET THE BRAVE MEN AND WOMEN WHO ANSWERED OUR NATION‘S CALL TO SERVE THE CAUSE OF FREEDOM IN A SPECIAL WAY. WE WOULD LIKE TO EXPLAIN THE MEANING OF THE ITEMS ON THIS SPECIAL TABLE. THE TABLE IS ROUND – TO SHOW OUR EVERLASTING CONCERN FOR OUR MISSING MEN AND WOMEN. THIS GLASS IS INVERTED – TO SYMBOLIZE THEIR INABILITY TO SHARE THIS EVENING‘S TOAST. LET US RAISE OUR WATER GLASSES IN A TOAST TO HONOR AMERICA‘S PRISONERS OF WAR AND TO THE SUCCESS OF OUR EFFORTS TO ACCOUNT FOR THEM. The military is filled with symbolism. Those listed as prisoners of war, missing in action, or killed in action are warriors who have served and those currently serving in the uniformed services of the United States are ever mindful that the sweetness of enduring peace has always been tainted by the bitterness of personal sacrifice. We are compelled to never forget that as we enjoy our daily lives, there are others who have endured and may still be enduring the agony of torture, deprivation, imprisonment, and separation from family and friends. We remember and honor them at this event. We must also be mindful of those Airmen currently deployed to protect our cherished liberties and freedom.